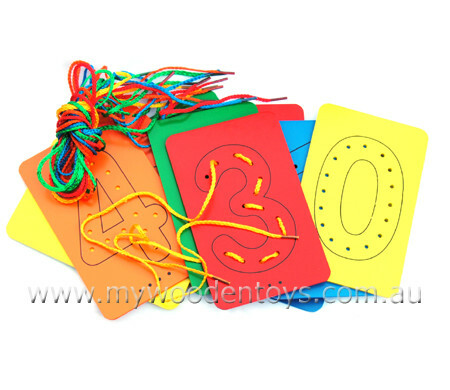 Lacing Number Wooden Cards are a simple set of colourful wooden cards with the numbers 0 to 9 printed on them. These ten cards have holes in them which follow the shape of the number. There are 10, 1 metre long laces which can be threaded in and out of the holes. A great educational toy which visually and physically sorts out those tricky numbers. This toy comes in a solid wooden box with a sliding perspex lid. We like this because: "Great tactile toy wonderful for physical learners."